There is nothing unique about this Disney-wannabe. Brad Pitt and Catherine Zeta-Jones do ok voices for a story that has nothing whatsoever to do with the original Voyages of Sinbad. This story is a total creation of the filmmakers tailored to include divine meddling (Eris is the sexiest character in this thing! ), the selfish hero who learns self-sacrifice and the strong, individualist female immune to his charms but bound to fall for him. Of course the man she is betrothed to marry is totally unidimensional. Won't spoil the ending by revealing who she chooses. If you're an adult looking for this kind of adventure try Steve Reeves in Hercules. If this is for your kids opt for Brother Bear - The characters are more sympathetic. Sinbad: A Lost Gem in the World of Animated Movies! The movie was amazing. The animation was so fluid and beautiful I felt like I was watching Prince of Egypt once again you know. Sinbad was a very round character. Someone who wasn't good but wasn't all the way bad either. The villain Eris was so amazingly cool. Her hair would flow through the air like it was apart of the wind. Her reappearing and disappearing similar to the Chesire cat. The ending to the movie was unexpected and hard to guess. Everything about it screamed a classic and a winner. Sadly this movie came out right when traditional animation was becoming lost. It's such an amazing film that if you don't buy you should rent it. It's like never watching the Lion King before. The mix of humor, action, and adventure will please both adults and children alike. 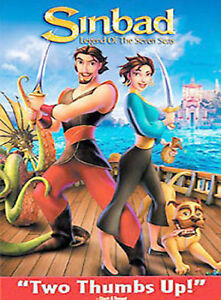 Disney's "Sinbad: Legend of the Seven Seas"
This is Disney's modern spin on a classic tale. Visually impressive, and boasting the voice talents of Brad Pitt and Catherine Zeta-Jones, it's entertaining for both children and adults. Disney is the only company to make a good pirate movie and this is no exception and since this movie is technically in "the vault" your not likely to find it anywhere else. In my opinion, it's just a fun, action-adventure movie that everyone will enjoy. dvd came quickly and was in great condition.